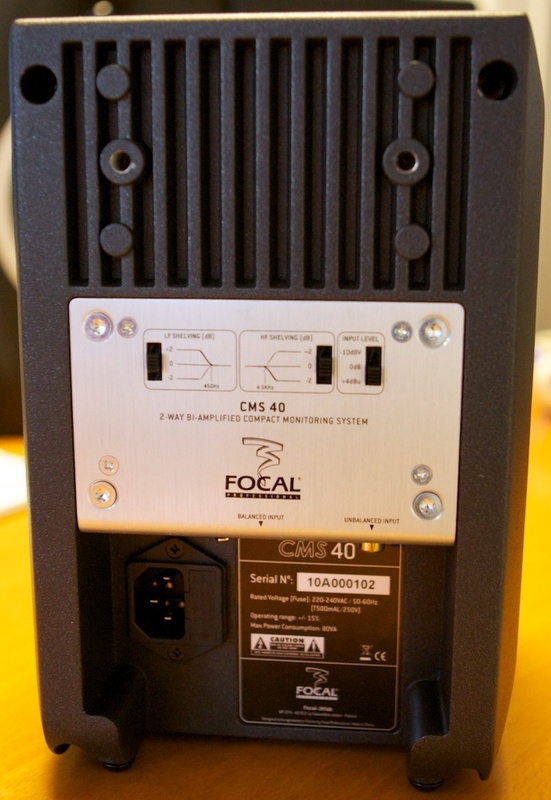 CMS 40, Active Monitor from Focal in the CMS series. 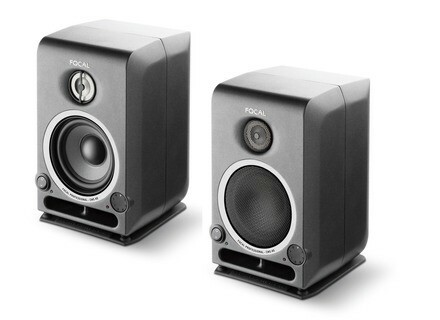 We all know Focal for their top-range speakers with undeniable qualities but, unfortunately, not affordable to everyone. That's why the manufacturer decided to launch a more affordable series a couple of years ago. It included two models, the CMS 65 and the CMS 50 equipped with 6.5" and 5" woofers respectively. A subwoofer is also available for brown noise fans. Both models received a warm response from users, so now Focal decided to launch an even smaller and less expensive speaker that benefits from all the qualities of its big brothers. Did they succeed? When we were unpacking the speakers, the first thing that surprised us was the very compact size of the CMS 40: 9.39" x 6.14" x 6.10" and about 12 lb. In other words, these speakers are very small and can be easily transported — which is good news, particularly considering they provide the same high manufacturing quality as their big brothers. On the other hand, they are also quite heavy — the price to pay for good quality manufacturing, I guess... You get the same reinforced and damped aluminum housing, black powdered paint and protection grills for both drivers: a 4" woofer made out of a polyglass membrane and an aluminum/magnesium reversed-dome tweeter. Once you comfortably set up the speakers, you can remove the protection grills and fix the tweeter phase plugs. According to the manufacturer, this improves their response. 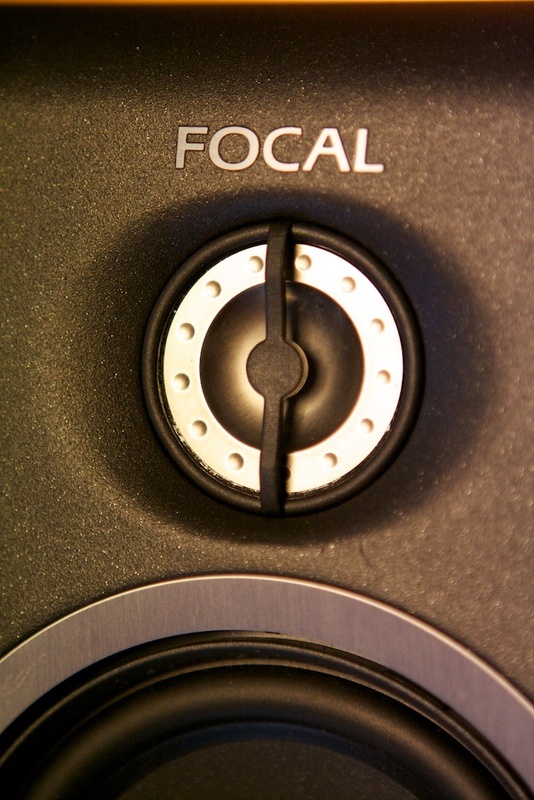 Since Focal is generous with accessories, you'll also find a decoupling table stand and four rubber feet in the box, as well as two height-adjustable spikes to tilt the speakers forward or backward, or even to the sides! It's important to mention that all CMS are magnetically shielded so you can easily place them next to a cathode screen monitor. Regarding speaker position, Focal advises the user to keep at least 1.3 ft from the CMS 40. The rear-panel fixing points allow you to mount them on a wall or any other support. The rear vertical connections allow you to mount the speaker directly against the wall, which is acoustically possible since the bass reflex housing is front ported. A very good feature for home studio owners who work in a "closet." You can use the CMS vertically, horizontally or upside down in order to keep the tweeters at the same height as your ears. In short, the small CMS is adaptable to almost any environment — a great asset. The manufacturer states that this speaker is not very sensible to the critical acoustic environments of non-optimized rooms! Let's start with some good points: the power on/off switch and the volume control (-66 dB to 0 dB) are conveniently placed on the front panel, where you also have power and clip LEDs. 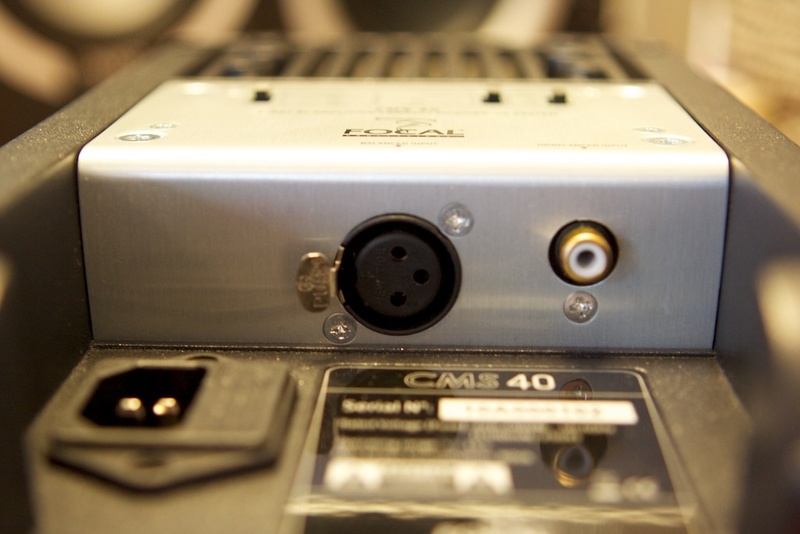 On the rear panel you'll find a balanced XLR input (10 kOhm), an unbalanced RCA input (47 kOhm) and the power socket. You can set the input level to +4dBu, -10dBV or 0dB. Adjusting the speakers' response is very simple with two filters: a low shelve (0 Hz - 450 Hz) with -/+2 dB amplification/attenuation and a high shelve (4.5 kHz -20 kHz). The frequency response stated by the manufacturer is 60 Hz to 28 kHz (-/+3 dB). Two integrated amps of 25 watts each (one per transducer) deliver 97 dB as maximum SPL level (@ 1 m). Unlike the CMS 50 and CMS 65, the CMS 40 has no real low-cut filter so you'll have to set the cutoff directly on the subwoofer (the CMS Sub for instance!) at approx. 60 Hz. However, we tested the monitors without a subwoofer since we had already tested it with the CMS 50 earlier this year. We compared the CMS 40 with three other monitor speakers: M-Audio DMS 1, Tannoy Reveal 601A and ADAM A3X. We listened to well-known songs and used the speakers in several home-studio situations (mixdown, recording, etc.). From the very first notes we were pleasantly surprised by the amazingly powerful and well-balanced sound coming from these small boxes. The low-end is far from ridiculous and we even had to check several times that the sound was actually coming from the CMS 40, rather than from a bigger monitor speaker in the studio. 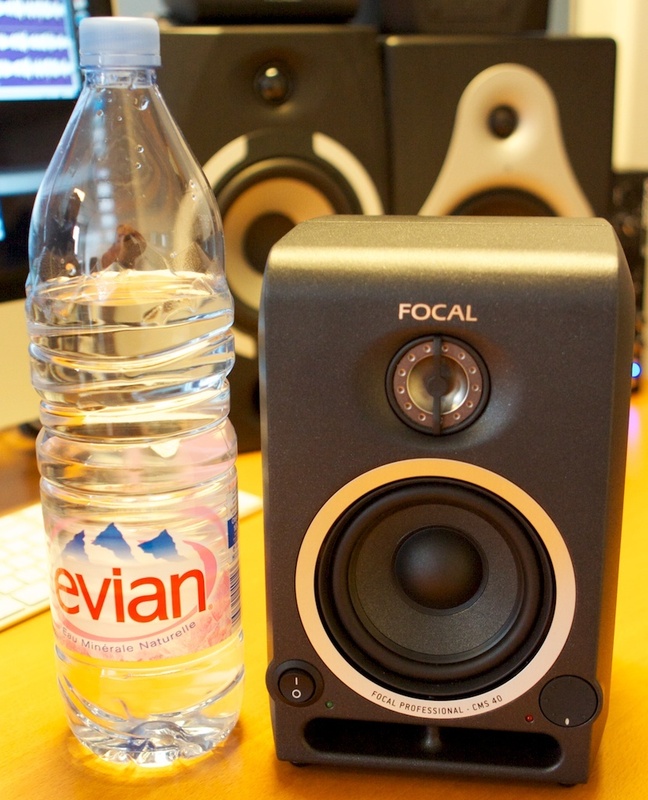 The small Focals show no mercy when mixing down thanks to some very present and detailed mids. Unlike many small-sized monitor speakers, the small Focals have no hollow response, which makes them seem a bit dull in the beginning. Actually, the sound is very well balanced and the middles are not masked by the high frequencies. The low-frequency response is much more limited than on 8" speakers, but it goes down deep enough and stays clear all the time. We noticed no masking effects (which usually make a mix sound blurry and unintelligible). The CMS 40 revealed some details, especially on vocals, we couldn't notice with other speakers. Very good! Moreover, our final mixes with the CMS 40 translated very nice and well-balanced into other sound systems, with no ugly surprises. 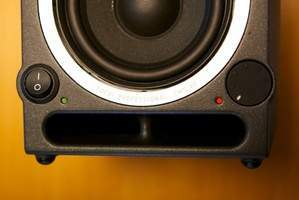 You'll probably have the feeling that the frequency response of these speakers is narrower — they certainly have less low-end and high-end than other monitors we've reviewed. But behind this feeling, there is the fact that the CMS 40 is often straighter: don't be taken in by the hollow sound of other models! If you listen carefully to speakers that seem to sound better, you'll notice that some details are missing in the mid frequency range. Generally speaking, the CMS 40 have a better dynamic response than other models we've reviewed: certain signals really cut through the mix, providing a more authentic depth feel. Another good thing is that the sweet spot of this model is pretty wide so you can move around in your room without too many surprises. Whats' more, the speakers seem to not be affected by the (sometimes bad) room acoustics. Now it's time to listen to our first song —Johnny Cash's "Hurt"— and compare the ADAM A3X ($600/pair) with the Focal CMS 40 ($800/pair). They have almost the same size and, besides, Audiofanzine will publish a full review of the ADAM A3X in the coming weeks. Cash's voice sounds closer to the listener with the Focals, but the guitar sounds brighter with the ADAMs. The overall mix is more hollow with the A3X, while high-mids are more accurate with the CMS 40. The depth of Cash's voice gets a bit lost with the ADAMs. Although you'll have the impression that the CMS 40 sound "boxy," at first, in the end they seem more linear than the ADAM. Let's go on with "Angel" from Massive Attack. The monster bass in this song reveals that the ADAMs can deliver a wider lower end, however the bass does sound more precise and has a more "intelligible" attack with the CMS 40. It might be that the ADAMs low-end tends to mask or blur certain frequencies. The drum kick sounds dryer with the CMS, it has no resonance at all and you can only hear its attack. The electric guitars in the middle of the song sound a bit more like a "bee nest" with the ADAMs. We switch to Raconteurs' "Consolers of the Lonely," a song with vintage-sounding guitars and very powerful drums. The bass drum sound seems to be less controlled and a bit softer with the ADAMs, while the Focals reveal a very dynamic response and produce punchy transients. Sibilants of vocals cut through with the A3X and the Focals emphasize the mid frequencies of the guitars. The latter seem to have a more linear and controlled response. In comparison, the ADAMs mid range seems to be way back. It's the turn of Michael Jackson's "Liberian Girl." During the soft intro both monitors have quite the same response, but as soon as Michael's voice comes in, we noticed a lack of low-mids with the ADAMs. Regarding details in the mix (like reverb decays) both speakers sound alike while the Focal scores higher on stereo imaging. The ADAMs have more "air" but the stereo image seems overemphasized and the high frequencies are way too upfront. With Metallica's "Enter Sandman" the Focal show their lack of low frequencies so that the bass guitar and the resonance of the toms stay in the background. On the other hand, the different guitar tracks are easily identifiable. The hi-hat sound is very different with both speakers: the ADAMs have a much brighter sound. Altogether, both models do a very good job with this song. On Gorillaz's "Feel Good," the drum kick is drier with the Focals, while the megaphone effect of Damon Albarn's voice seems a bit exaggerated with the ADAMs. The bass sounds more "boomy" with the ADAMs and it is less intelligible than with the Focals. And what about the double bass on "Walk on the wild side"? The resonance of the instrument is not audible with the CMS 40, you can only hear the strings! Lou's vocals seem closer and more present with the Focals. On the other hand, the snare drum cuts better through with the ADAMs. On Miles Davis' "Seven steps to heaven," the double bass seems shier with the Focals but the trumpet sounds smoother and warmer than with the A3X. The ride cymbal has a sharper attack with the CMS; in general, dynamic response and transients are more faithful. With the ADAMs, the attack of the double-bass notes is a bit inhibited by the resonance of the body, which is not the case with the CMS 40. But the sound of the instrument's body is almost inaudible with the Focals! On "Thus Spoke Zarathustra," the brass sound is tinier with the ADAMs and we noticed the same basic differences as on the other songs. Kettledrums have more depth with the ADAMs, while the Focals reproduce almost only the sound of the skin. 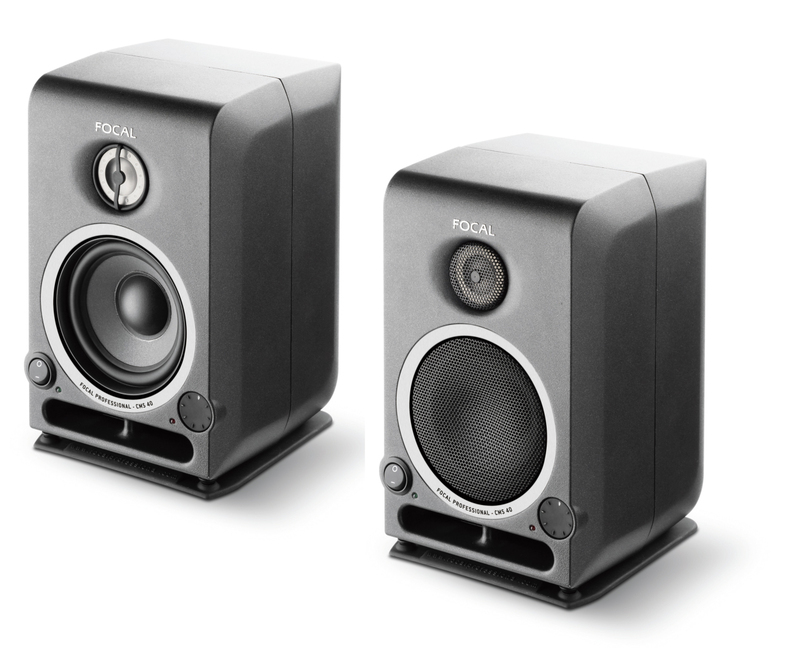 Focal introduces a very surprising compact speaker to extend their CMS range, whose previous models were very appealing. The CMS 40 is no exception with its irreproachable manufacturing quality, plentiful accessories and remarkably well-balanced sound. 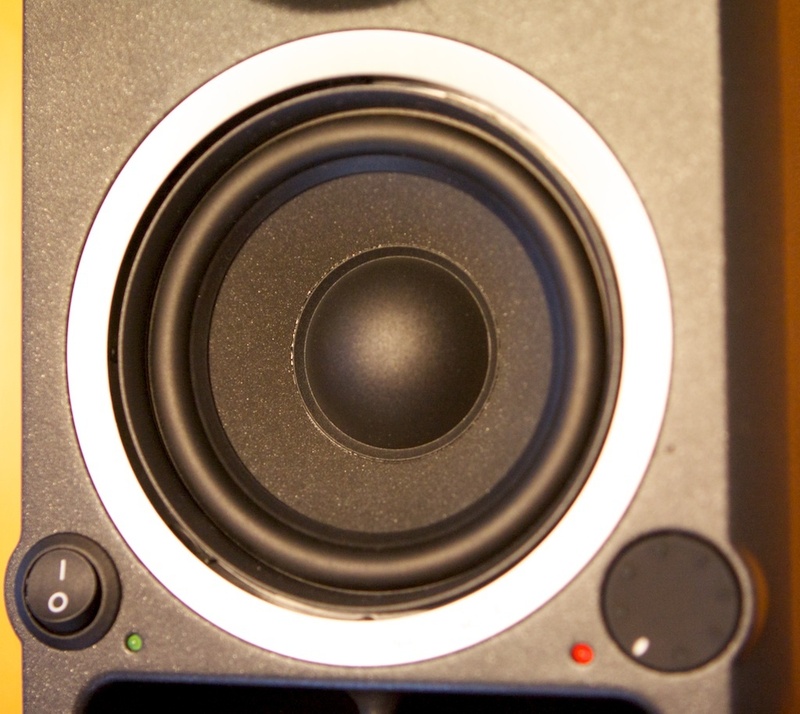 Considering its 4" woofer, the CMS 40 delivers a clear and dry low-end and very present and analytic mids. The high-frequency response is also good, just like the CMS 65 and CMS 50. We noticed that the sound is less hollow than with other speakers and that the CMS 40 sound more linear than the ADAM A3X, even if the frequency response of the ADAMs is wider in the low and high ends of the spectrum. The CMS 40 do a very good job when mixing and they reveal details you could miss with other speakers. We had no surprises listening to our mixes through other speaker systems, which is a very good point. Moreover, the CMS 40 has a wide sweet spot and can be used in a room with poor acoustic properties. At $800/pair, this monitor speakers are highly recommended for mobile home studio owners or people working in a very small room who want to buy a well-built and faithful speaker pair.